The price of gold has fallen again after the cost of dealing in the metal jumped sharply on two key exchanges. Hopes the global economy will stabilise also prompted sales. Fears about European and US debt and growth prospects had led investors to buy gold - which is seen as a safer investment - in recent months. Thursday trading saw the spot price of gold fall to $1714.4 an ounce, a drop of 10.4% from Tuesday's record high of $1913.5. The price of gold has risen steadily this month during a tumultuous period on the markets caused by fears about the global recovery and the eurozone debt crisis. On Thursday, a major market place for speculating on the price of the metal, the CME, raised dealing charges by 27%. The initial-margin requirement, or the minimum amount of funds that speculators must keep on deposit, will rise to $9,450 per 100-ounce contract from $7,425. That was the CME's second increase in a month. The Shanghai Gold Exchange has also this week raised the amount of margin investors must keep to trade in gold. David Thurtell, an analyst at Citigroup, said the increase in margin requirements had pushed some to sell: "With the margin hike, if speculators don't have the money [for the] extra margin they'll just cut their positions." But he also said there had been profit-taking over the past 24 hours. The gold price has risen about 25% since July and some investors saw this as a good time to sell and crystallise some of their gains. Analysts are hoping that the Federal Reserve chief Ben Bernanke will signal more economic stimulus when he speaks at a gathering of central bankers on Friday. A healthier US economy would provide a broader range of places for investors to put their money and lessen the need for a safe haven investment. A third bout of quantitative easing QE - in which the central bank injects new money into the economy - is seen as unlikely, but investors are still hoping further stimulation is on its way. However, QE was also previously cited by other analysts to explain the jump in the gold price to its record high on Tuesday. 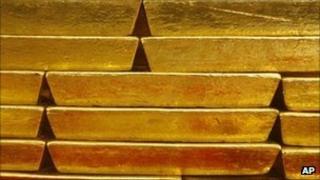 According to that line of thinking, QE could depress the value of the dollar, making gold a more attractive investment.